*This post brought to you by Better Homes and Gardens Products at Walmart. Happy Wednesday! I’m so excited to show you how I gave my bedroom a few updates for Spring! I re-did the bedroom last year, but there were a few things I wanted to update for the warmer months this year. I found this beautiful pin-tuck three piece bed set at Walmart.com. I love the bright white for warmer months. I also added a set of crisp, white Egyptian Cotton sheets to my cart. They are wonderful! Probably my favorite change are the new nightstands! 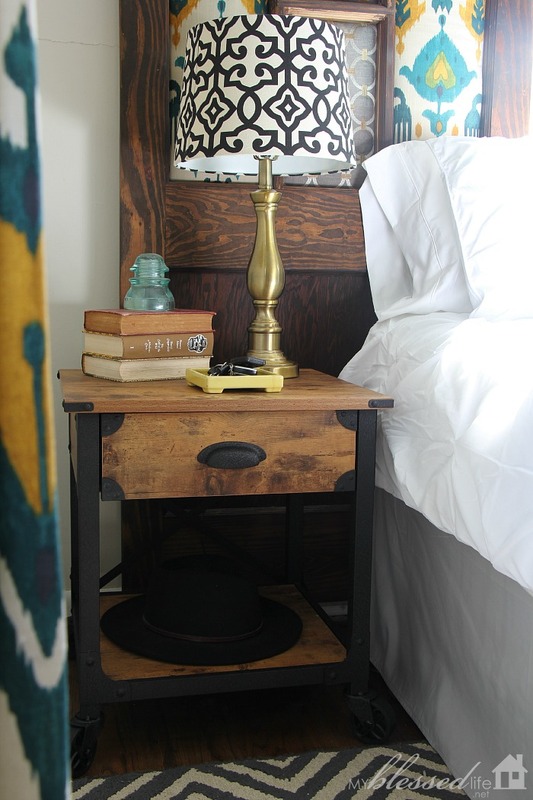 The nightstands that we have had were too tall and they didn’t have enough surface area. 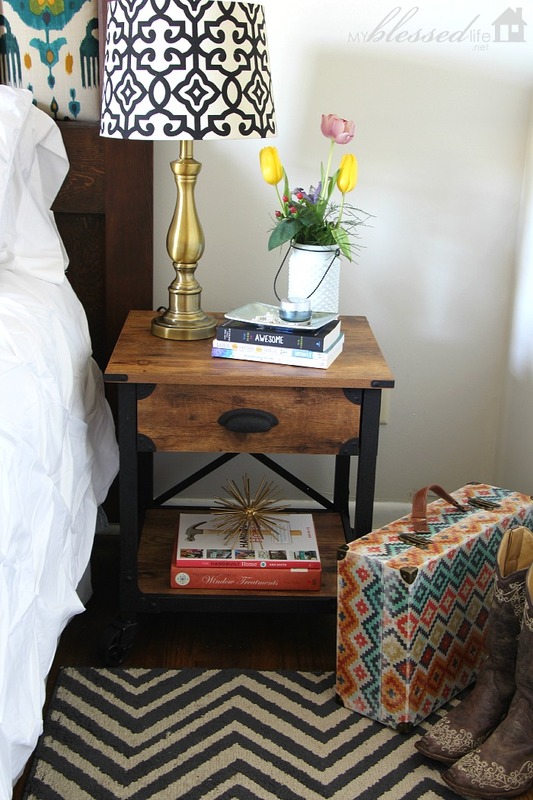 These affordable Better Homes and Gardens Rustic side tables are perfection. I love the surface area on top. The drawer is great and the shelf on the bottom is fabulous. Oh, and the casters. LOVE them! 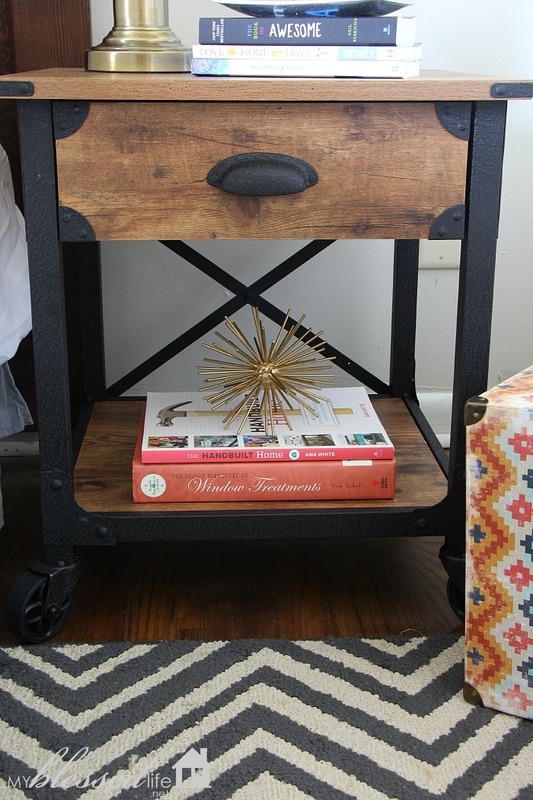 The style of these tables is much more on point for the vibe of our bedroom. And this is Ernie’s side. His Stetson cowboy hat finally has a home on the shelf. 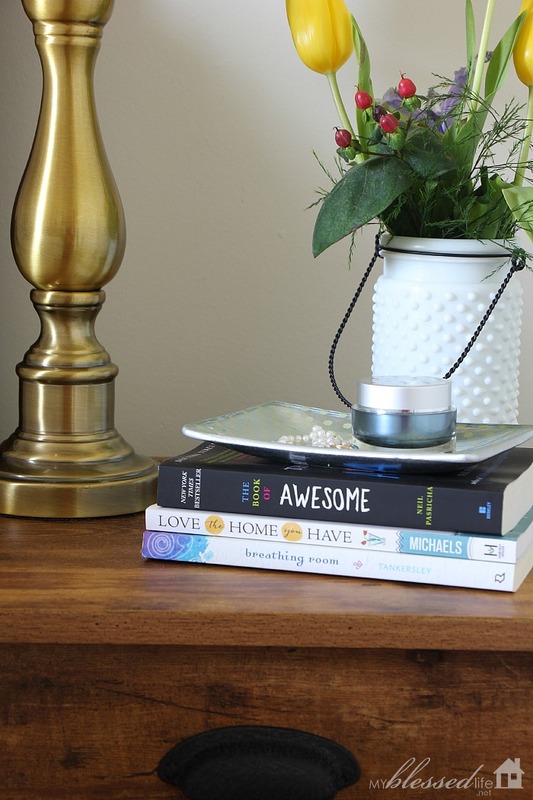 The brass lamps and lamp shades are also Better Homes and Gardens products I found at Walmart. Here’s a close up of the pin-tuck texture. It makes me smile because it’s cool, calm and collected. Perfect for this time of year! Before & After. 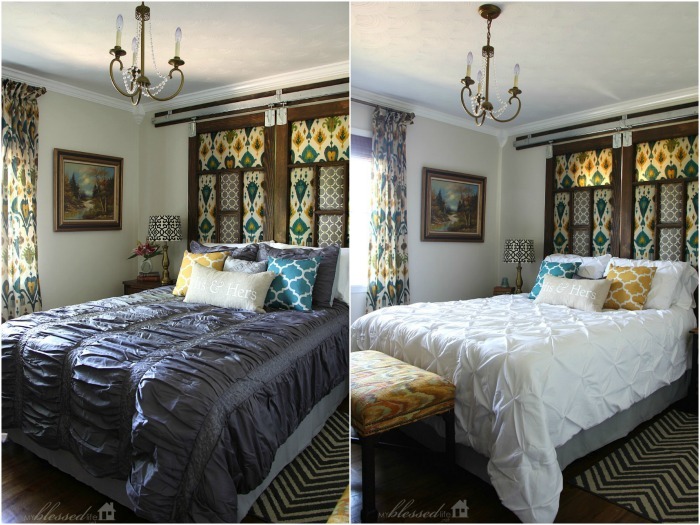 Remember to see the original bedroom makeover post here. 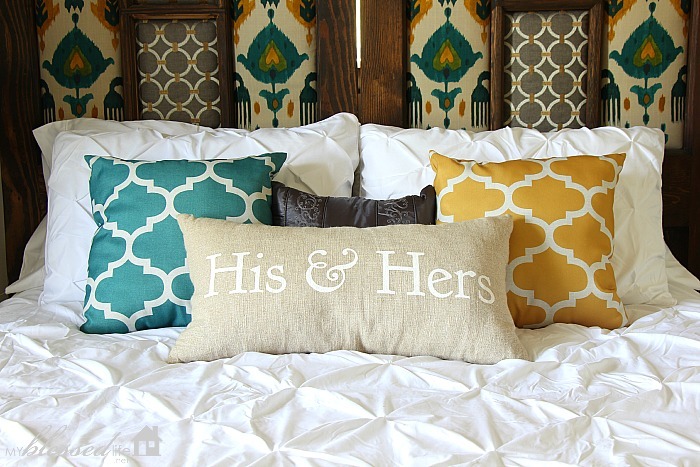 Do you refresh your home for warmer months with lighter and brighter linens and bright, happy colors? This post is sponsored by Better Homes and Gardens products at Walmart. As always, the opinions expressed in this post are my own. 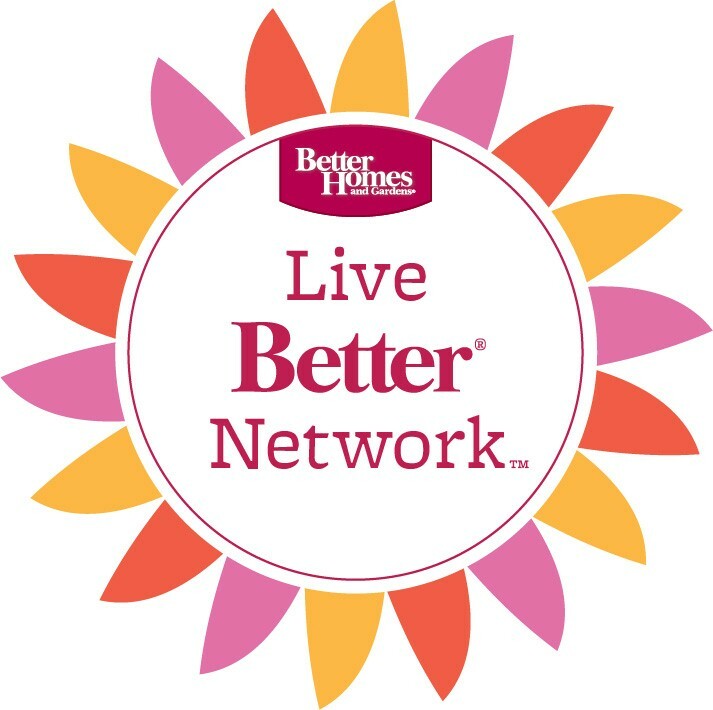 Follow BHG Live Better on Facebook, Pinterest, Twitter and Instagram. Looks lovely. So light and bright with the white bedding. 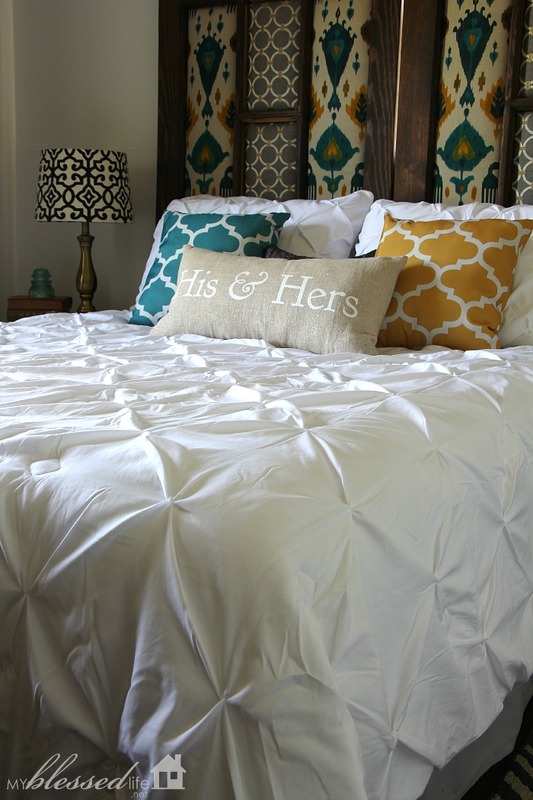 Love the pintuck comforter – very pretty. As always Myra, a lovely mini make over. Just swapping the comforter makes such a huge transformation. Just lovely. I love the wall treatment too. Cheers! You did an awesome job pairing up all the patterns. Looks great!! I love your H&G posts— after the one with the 4 cube shelving I went out and bought 2 of the white to update my room as I’m transitioning out to more white! I’ve been looking for a white or cream pin/tuck comforter for awhile now, but all reviews I see talk about how wrinkly it is when its first bought and hard to get them all out. how was your better home and garden one? Awesome! 🙂 I haven’t had any problems with mine being too wrinkly. 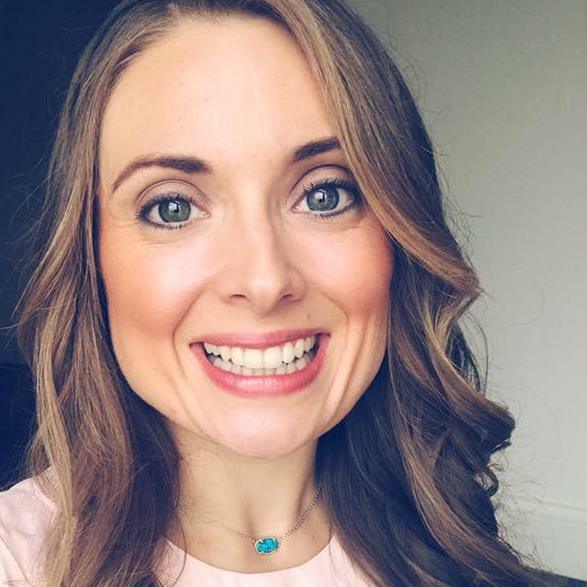 Maybe I just embrace the wrinkles? HAHA! I love the rustic yet elegant feel to this room! 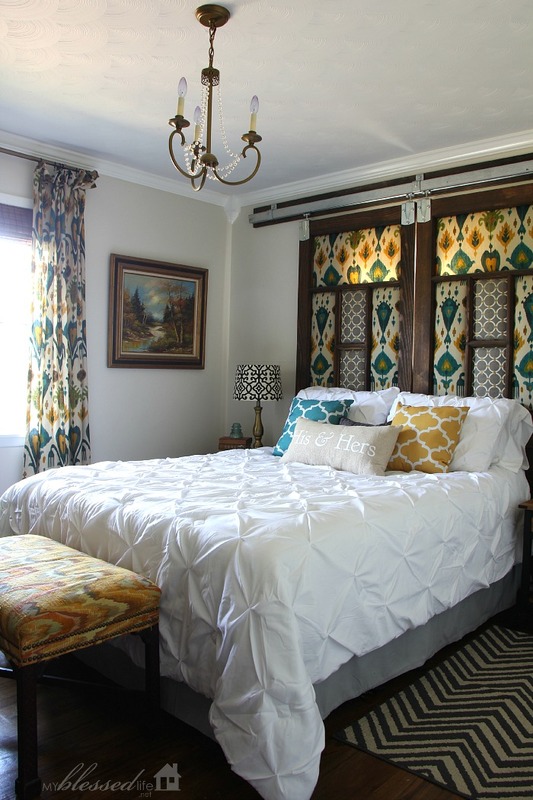 I love the master bedroom makeover…..it looks so fresh and spring-like! 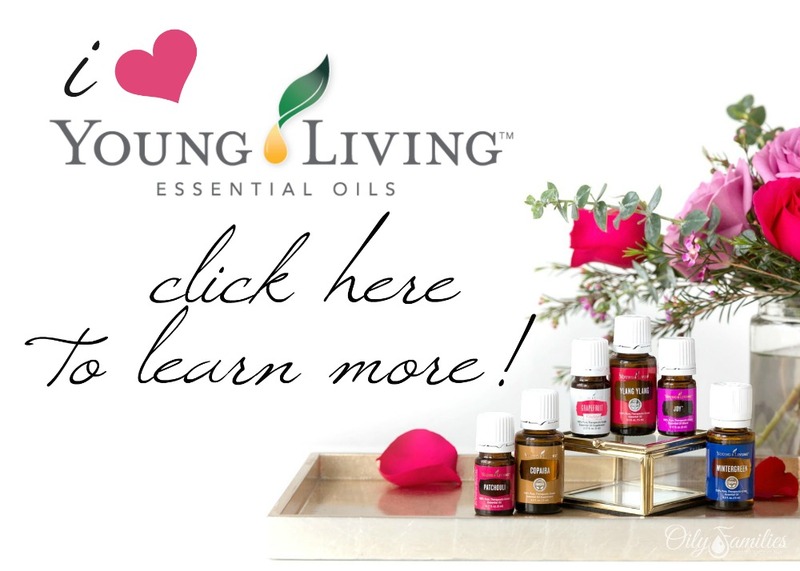 Thanks for sharing – I always love your decorating posts! Lovely! So light, serene and refreshing. Love the makeover. But please please don’t store Ernie’s steson like that!!! One should always set a hat either in a specific hat box or at least not on the rim!!! 🙂 Just tu;rn over !!! Sorry to be a stickler . :LOL but love the room. Hey Myra, It’s beautiful, I like the transformation that you did. It looks fresh to the eyes. Thank you for sharing all of these. Nice ethnic theme, I think at least one room of the house should have that theme and those colors so complementing each other. Thanks!